Rhino development and Flamingo Rendering by Michael Chudy, first graduate of this course. Purpose: The purpose of this eleven lesson course, is to instruct YDS course students, practicing designers, and draftsmen in "on screen" design. It utilizes the Rhino software which the industry accepts as the best software for on screen design of yachts and small craft currently available. The course centers around the development of hulls and decks of various types. Lessons 7, 8 and 9 cover detailing, rendering and producing practical direct output as final drawings, and for pattern making for builders of your designs using both computer controlled and manual pattern production. Lesson 10 covers stability calculations. This course is for the student ready to make a commitment to CAD. These days knowledge of CAD, however acquired, is necessary to the process of learning to be a good designer. It is also now essential in finding work in the field. We believe this to be the only complete course in the use of Rhino for yacht and small craft naval architecture available today. This not only includes hull lines, but also cabins trunks, interior joinerwork, construction details, and then going on to use these models in developing drawings, manufacturing information, jigs, and tooling. Anything that can be drawn can be shown in color and with various lighting schemes. 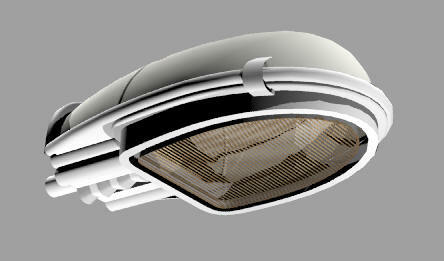 Tools are provided to allow refinement of the models to produce very clean accurate geometry for further use. These drawings can be used as illustrations in client meetings, for promotion, and as illustrations in design articles. It has proved possible to sell stock boats drawn in Rhino and rendered as photos in Flamingo before the first example is even built. This makes it an extraordinary selling tool. All components, fittings, and systems can be placed in the boat, and modeled in any detail desirable. Clearances can be checked. Loft fast and accurately. Design tooling, molds and jigs which can be produced by third parties automatically from Rhino files. Create and expand (unroll a flat pattern) developed surfaces. Generate files that can be used for computer cutting of sheet materials and for developing patterns, tooling and molds for full three dimensional parts. 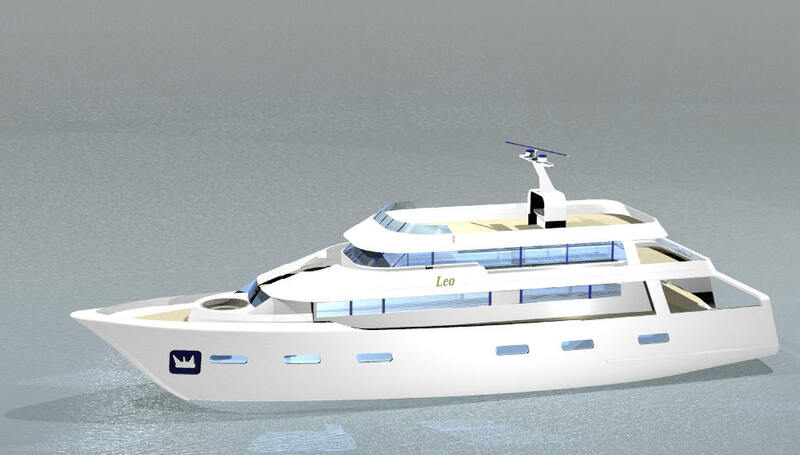 Mega-yacht designed in Rhino by student Leo Huang of Taiwan while on Lesson 6 of this course and rendered using Flamingo. 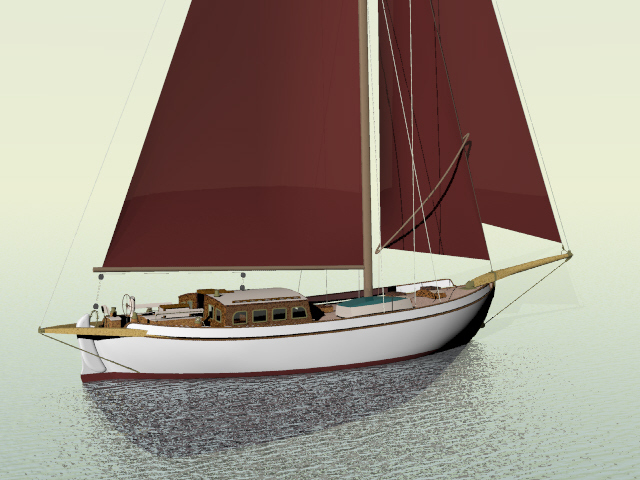 Support: Yacht Design School provides lesson materials, email and, when needed, telephone support and "coaching", test correction, and support for all design related questions. All this is included in the basic lesson cost. The pricing assumes substantial individual personal assistance will be necessary and students will be encouraged to submit files over the Internet and communicate frequently. Naturally the software producer provides their regular support for actual use of the drawing tools under their regular policies. The course structure is our own. The authors of the software are in no way responsible for our teaching methods. Process: The entire price of this course is paid up front and you immediately receive all the lessons, additional texts, and support files over the Internet. However since this course is revised frequently you should, upon completing a lesson, send us the revision date of the next lesson. If there have been revisions since then we will email you the more recent version. Each lesson can be completed within approximately one week of evening work and weekend work for those able to study on a regular schedule. Instructor assistance is expected to be extensive and is conducted by email with files being emailed back and forth between instructor and student. Upon completing the course you will receive a certificate attesting to your knowledge of Rhino and you may request the latest course revisions at no charge if any revisions have been made in the course in the time you've been taking it. There are no extra charges if you need to stop for awhile and resume the course at a latter date, though you should ask us to send revised lessons if you do so.